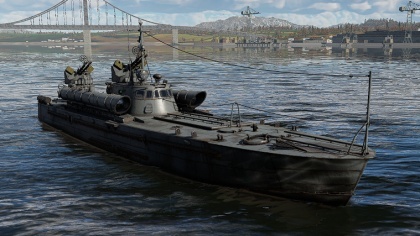 The Project 123bis is a rank I Soviet motor torpedo boat with a battle rating of 1.7 (AB/RB/SB). It was introduced during Update 1.79 "Project X" when the Soviet fleet was implemented into the game. X-Ray view of the Pr. 123bis showing key components that are prone to be damaged when taking enemy fire. The Pr. 123bis doesn't have any armour in the game. When under fire, it is almost certain that an opponent will disable your engines and/or set you on fire (see image on the right). However, you will very rarely be destroyed due to an ammunition explosion. The Pr. 123bis can reach speeds over 120 km/h in AB and around 90 km/h in RB and SB. Backwards, the Pr. 123bis can reach -45km/h, so there should be no trouble reaching strategic points first or at the same time as the lighter boats. The Pr. 123bis turns very quickly, a tactic which should be used to flank opponents and destroy them with machine guns. Lastly, it is unwise to come to a full stop, due to the fact the ship becomes a "sitting duck", easy to pick off by enemy ships or aircraft. Primary armament composes of two, dual mounted DShK heavy machine gun turrets with one located at the stern and the other at the centre of the vessel just above and behind the bridge. Note that the turret at the stern is obstructed when pointed towards the bow due to the other turret therefore somewhat restricting fire coverage. The turret just behind the bridge has near 360° though it is slightly obstructed by the mast when pointing towards the bow. The DShK 12.7 mm guns provide good firepower and rate of fire against similarly sized ships and somewhat larger ships thanks to its heavy calibre. They have an ammunition capacity of 1,000 rounds with reloads taking ~4.7 seconds. Available belts to research include the high explosive incendiary (HEI) and armour piercing incendiary tracer (APIT) rounds. The Pr. 123bis carries two 450 mm wet-heating 45-36NU torpedoes. They have a range of 3 km at a speed of 78 km/h or a range of 6 km at 73 km/h with the Torpedo Mode module installed. They are placed at the bow of the boat and fired out already at speed, so you can surprise your opponents with your torpedoes, unlike early American boats, which simply throw the torpedoes to their sides. Be careful with your torpedoes! 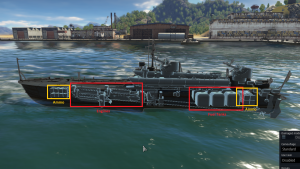 Due to torpedoes being fired out of their tubes at an upwards angle, this means that your torpedoes might over-shoot (literally) any boats which are passing right in front of the Pr. 123bis. The Pr. 123bis can carry 6x BB-1 depth charges, which can be used as timed mines to damage/destroy tougher enemies. You can place depth charges around a capture point if you get there first, or in front of an enemy. Remember to set your Depth Charge activation time before battle, if you carry depth charges. The default option of 3 seconds is too short to be useful, so it is advised to set it to something between 5-8 seconds to keep your options open. The Pr. 123bis is one of the first Russian boats that get decent firepower, which can destroy its opponents very quickly. Moreover, it gets two torpedoes, which are fired forwards at speed (can be an advantage, but also a disadvantage). All of that weaponry is placed on a motor boat which can reach very high speeds. 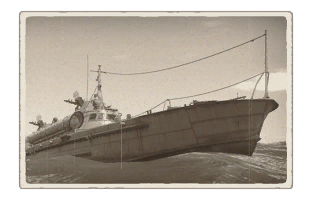 It's a boat that will help you grind out USSR rank I fleet. The Pr. 123bis strikes a balance between speed and weaponry. At its low battle rating, the two dual 12.7 mm machine guns reliably destroy all light boats, experiencing difficulty only in a full up-tier. For the most part, the Pr. 123bis should be used as a flanker. Your machine guns destroy compartments with 3-5 bursts, and if you get the first shot on most of your opponents, they are most likely going to die very soon after. However, if you meet tougher opponents, it is viable to simply cross the map around the flank, (ignoring the lighter boats) while the opponents are focused on their front, and fire your torpedoes at their sides (best done when up close and personal). As a rule of thumb, you should never remain stationary. The Pr. 123bis doesn't have any armour, and all other boats at its battle rating can kill it, so to make it much more difficult for the opponents, try to stay at your top speed and avoid head-on encounters. Although, you can still handle some threats from the sides because your guns' rotation speeds are very fast.